Today I dropped by Heartwood House to drop off my old computer bits and pieces, all those obsolete electronics that have been cluttering up the house. Heartwood House, which is conveniently located in downtown Ottawa at Rideau and Chapel, is home to the Everybody Wins Computer Recycling Program. 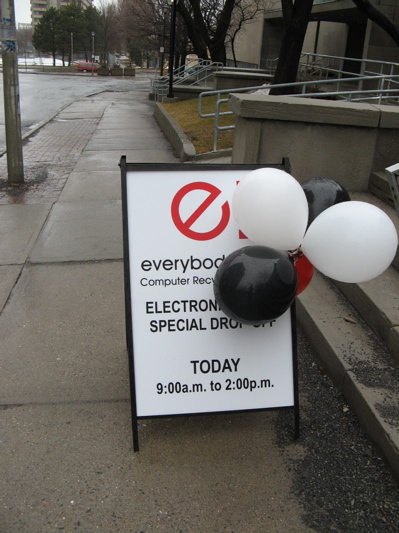 The Everybody Wins program accepts all types of computer hardware: towers, drives, mice, cables, keyboards, monitors, printers, speakers, disc-burners, even CD-ROMs and DVD-ROMs. Heartwood House ask for a donation of $2 each time you donate, to cover their administrative expenses. They also charge a $20 fee for each old-style CRT (cathode ray tube) monitors because of the special processing they require due to the lead and other hazardous chemicals they contain. (By weight, CRT monitors are composed of a shocking 25% lead). On the other hand, for each tower you bring in that is 6 years old or younger, they will give you a tax receipt for $15-$25. The actual electronics recycling is done by the local company RDLong Computers who have made it their mission to divert as much end-of-life electronics from landfill sites to alternative re-use and re-cycle streams as possible. Heartwood House, home to 16 charities, receives a portion of the recycling proceeds RDLong generates. RDLong also donates some of the salvaged, still usable computers to The Anti-Poverty Project, a local charity that provides computer systems, software and education services to groups around the National Capital Region that work with low-income individuals providing internet access and opportunities to improve computer skills and employability. Do you still take complete sets of computers ??? ie CPU + Modem + Monitor & Keyboard ??? “By weight, CRT monitors are composed of a shocking 25% lead”, i suggest you read an article from the following site. The telephone as listed on this site is missing one digit. Thanks for the info. It is so benificial and above all-easy to recycle. Thanks for a great post! Do You have a Drop Off location in the Eastend , Orleans area ?? You will need to contact the organization directly. This blog is not affiliated with them in any away.